Join our European art and innovation movement to unpollute the sea!! Let's inspire, find and spread sustainable solutions against this major anthropogenic problem of plastic waste. Art can be a catalyst for change, while entrepreneurship enables the long-term success. The European University of Flensburg has joined The Universal Sea as a partner institution. It has invited the London-based designer Frankie Moughton-Small, one of the selected artists in The Universal Sea’s Open Call, to its Artist in Residence program of this year. As artistic intervention is at the core of The Universal Sea project, co-funded by the EU, Frankie Moughton-Small’s proposal was selected as one of the final winners of the international open call to artists. She embarked on its artist residency program. The UK designer graduated from BA Jewellery Design at Central Saint Martins in 2017. Her graduate collection, focussing on the issue of plastic pollution in the seas, has been exhibited as part of the Theo Fennel ‘Gilded Youth’ graduate showcase, and at ‘Creative Unions’, a Central Saint Martins graduate exhibition, in association with London Design Festival 2017. Whilst in Flensburg, the young designer will be working with plastic debris found in the fjord and creating new works from it. She will also be speaking about her work and engaging with the art students of the university on the issue of plastic waste and how it can be used in art and design, as part of The Universal Sea’s series of public engagements over the summer. 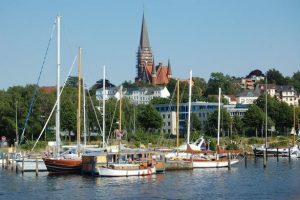 The European University Flensburg is located on the calm and picturesque shores of the Baltic in northern Germany. The waters and beaches of this scenic fjord are however, like almost everywhere else in the world, polluted with plastic. The Flensburg University Art and Media Department, and Art Professor Kaethe Wenzel have been running projects that encourage their students to develop ideas to avoid, remove and address the issue of plastic in the ocean. Moughton-Small’s work focusses on transforming plastic marine debris into objects of value, hopefully making a viewer reconsider the throwaway position plastic occupies in our society and offering a more positive perspective on plastic waste. Next → Next post: A new future for Europe and beyond! Keep it pure or keep it plastic? Your choice, your action. It’s easy, join us and let’s make it change!